This supplement clocks in at 21 pages, 1 page front cover, 1 page editorial, 1 page ToC, 1 page SRD, 1 page back cover, leaving us with 16 pages of content, so let’s take a look! We kick off this installment of the Underworld Races with a general subterranean origin-myth for the races that inhabit the lightless depth of Aventyr – which can, coincidentally, be introduced with relative ease into other settings. 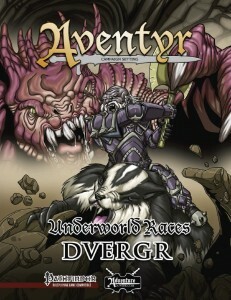 Now part of this myth is the genesis of the dwarven races, of which the dvergr would be one – to be more precise, the race is most in line with the dueragr base race, though it is modified further with some minor skill modifications. The dour, aggressive dvergr also benefit from quite an array of diverse favored class options, quite a few of which utilize an interesting distinction in that they represent the xenophobic frame of mind of the dvergr by being explicitly efficient against the Upperworlders. The FCOs, all of them, actually are rather neat – no complaints here. Beyond these, we receive perhaps one of the most ambitious archetypes I’ve seen in quite a while with the Underminer cavalier archetype. While the archetypes’ first columns lack the bolding of some ability-names/restrictions. The archetype per se is all about dire badgers and similar burrow speed utilizing mounts – now the great thing here, would be, that the archetype actually may not only carry the underminer cavalier below the surface, the archetype also provides an interesting mechanics to cover carrying passengers with the cavalier on the bumpy ride – so yeah, the tunnel may collapse soon after, but this class makes for some glorious scenes…and if you can’t imagine a scenario where this will be awesome, drop me a line and I’ll give you some ideas. Burrowing trampling and erupting from the ground as part of a charge (including rather painful potentials for being caught in mini-cave-ins), generating difficult terrain and yes, even concise rules for wrecking structures can be found among the arsenal of these badger-powered subterranean tank-like beasts. We also receive quite an array of cool of items with aerodynamic picks, special grappling bolts and the deadly ambersticks (essentially alchemical dynamite) and 6 new racial feats allow dvergr to dwell in their xenophobia and further enhance their hatred for upperworlders. Special tricks to avoid ending up in a bury zone and options for throwing picks for a unique fighting style between melee and throwing. Goggles that help underminers and similar characters with the tremor sense they grant and darkvision/x-ray-vision granting spyglasses can also be found within these pages, as can a spell to detect dwarves, one to escape to the surface by following gleaming motes of light and one that generates a superbly effective collapse. Mike Myler and Julian Neale’s Underminer is one absolutely glorious archetype and the items, alchemical and magical plus spells make for a great supplemental material. The dvergr’s origin myth and glimpses into their xenophobic society make for a great read – and the top-notch production values make this a gorgeous pdf to read. That being said, while there are a couple of minor formatting glitches, this would still qualify for the highest of ratings, but on the downside – we could have used more information on dvergr society…and generally, more content. If you strip away the general myth you may know from other Underworld races-pdfs, one has to concede that a couple of more pages of content would have been nice indeed. Due to the relative brevity and the cosmetic glitches, I’ll settle on a final verdict of 4 stars – if the archetype even remotely interests you, be sure to check this out. You can get this nice supplement here on OBS!